Chastened, I crafted this new one in my head whilst toiling on a cross-training machine last night. It is unrelated to my 500th post -- that's so several days ago -- but it duly incorporates a proper name to fill out a line of dactylic dimeter. 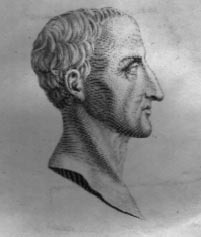 Some quotations from Pound's "Homage to Sextus Propertius" can be found here. I hope that this elegy will whet readers' appetites for Sextus Propertius. His standing with the American public is either nonexistent or incomprehensibly low. This may in part have to do with a singular disservice done him by Ezra Pound's 'Homage to Sextus Propertius' -- the moronic pastiche of our eternal sophomore enamored of foreign name dropping. Largely, though, this is so because, as regards the literature of antiquity, we are the true barbarians. The shorter shrift we give it, the deeper we bury our imaginations and the greater the desert of the human heart. Propertius can make it more habitable. By reading him, we may at least learn what it takes to endure 2,000 years, without being a messiah. Without the knowledge of what it takes to so endure, our run is bound to be short indeed. Propertius in the original Latin is available online in several locations: here, for instance. A complete English prose translation of the elegies is downloadable here, in a variety of formats. Elsewhere, you can find some rhyming verse translations by Franklin P. Adams, not including IV.7, an unrhymed verse translation of which can be found here [in PDF]. Nice d-d, GW (around here, of course, one is "in for a pixel, in for a pound"). For a few decades, there was a debate over whether English language haiku must also use a translation of one of the Japanese season-words (kigo). There are thousands of them in the Japanese haiku tradition, many of which have no useful point of reference for non-Japanese people. Using English translations of Japanese kigo would obscure the meaning of the poems for speakers of other languages and those living in other climates, with other flora and flauna and geography. Therefore, except for a few English haikuists who feel rabid about needing season-words, it is clear that there is no season-word tradition or rule in English language haiku. Perhaps you will be the great liberator, Sylvan Fool, breaking away from double dactyl tradition, because -- gosh -- proper names (not to mention rules) are just so out of sync with modern English poetry and the English language.